Masquerading as a fun, little tropical treat, this luscious lip balm glides on like silk and packs some serious skin nourishment. Rich, exotic butters and 100% natural oils hydrate and protect against wind, sun, heat, cold, and environmental damage. Vitamins and powerful natural antioxidants provide rejuvenating relief. Soothe your kisser with these delicious flavors and let your lips think they're on vacation. Cocoa Butter - 100% Pure and organic, confectioners' grade cocoa butter with no added flavors. Yum! A little heavier than our regular lip balm for extra conditioning. Did we say "yum?" Coco Mango - A dreamy tropical vacation for your lips with a blend of juicy, mouth-watering mango and smooth, creamy coconut. Try our Coco Mango Onolicious lotion and sugar scrub. 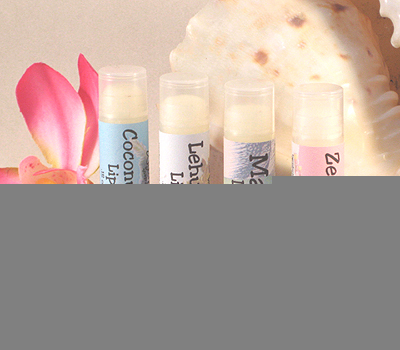 Coconut Cream - This is a take-me-away-to-the-islands kind of lipbalm. Perfectly coconutty, rich, and subtly sweet. Ginger Spice, $4.99 - An exotic combination of pure essential oils of cardamom for energizing and fresh ginger for centering. Kona Coffee - Genuine coffee bean butter gives this java balm a rich fragrance, extra moisturizing, and a delicious boost of anti-oxidants. Lehua Honey - The rare sweetness of pure Hawaiian honey, warmed by the tropical sun and kissed by the volcano's heat. Lick My Lips Vanilla - Better than ever, smooth vanilla buttercream goodness. One of our best-sellers! Mandarin Spice Lip Balm, $4.99 - Our unique blend starts with clean, energizing green mandarin. We add warm, spicey ginger and a touch of cardamom for an sensual finish. See the rest of our Tangaroa Men's Skincare. Margarita - Our refreshingly perfect, sparkling lime cocktail is slightly salty, juicy fresh, and quite sassy. Papaya Smoothie - Sweet, ripe papayas blended with a touch of mango and passionfruit for the ultimate tropical treat. Peppermint Tree - Pure essential oils of peppermint and tea tree. Brisk excitment for your mouth. Pina Colada - A wonderful blend, slightly sweet. Umbrella not included. Pink Cupcake - Fluffy sweet frosting and a few sprinkles delivered right to your lips. Pink Lemonade - Our new flavor has more sassy fruitiness and a lot more fresh-squeezed yum! Slightly sweet and a little tart, completely juicy and irresistible. Pomegranate - Sweet and regal, yet sinfully delicious. Strawberry Cheesecake - Glossy and sweet lip balm from our Little Miss W collection. Tahitian Grapefruit - Pure essential oil from juicy tropical grapefruit. Zen Green Tea - Our new jasmine flavor green tea is smooth and centering with a delicate sweet fragrance. Subtly energizing and fresh.